Scope: Are you trying to do too much? I don’t mean to be negative, but have you ever asked yourself why projects fail? I’m sure you can come up with a great long list. Today I’d like to address just one – trying to do too much, also known as having the wrong scope. You must have come across projects which you feel would have succeeded if only they had set their sights a little lower – and stuck with that. I’m not just talking about “Scope Creep” where the project grows during its course, but I’m including the projects where the scope was too big from the beginning. Optimism is a good thing. If we don’t believe we are going to succeed, we are unlikely to start a project. If we don’t believe we can succeed, we are not going to try and we almost guarantee failure. On the other hand, if we commit to a project which will require all the resources we have, and then something else comes up, then again we are not going to succeed. The scope of a project needs to be realistic. It needs to recognise that the objectives of the project need to be compatible with the constraints and the environment in which it operates. A project which has to deal with outside events is likely to be less productive. One of the keys to effective project management is for the sponsors, management and workers to agree what they want to achieve – and then stick to the plan! Agreeing the scope of a project is one of those areas where technical skills and so-called “soft skills” are required. You may find what you are doing being influenced by politics and things outside your control. There are tools you can use to help you to get and to document agreement. Aim to get the different parties to agree what is “in scope” and what is “out of scope”. The Agile project management methods emphasise prioritisation and create opportunities to adjust the scope of each iteration. There is less need to get it absolutely right first time. I recommend holding workshops where the different stakeholders can agree what the project scope. Within these workshops, I use a technique to help the participants agree and document the project scope. The technique is simple and I have created a short course so you can learn. Go and have a look now. 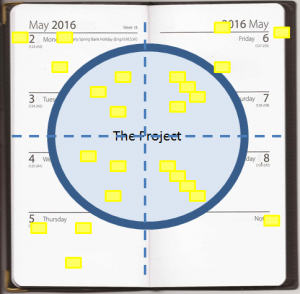 Author Tom GilliesPosted on 2016-05-02 2016-06-24 Categories Access, Project ManagementTags planning, project management, ScopeLeave a comment on Scope: Are you trying to do too much?